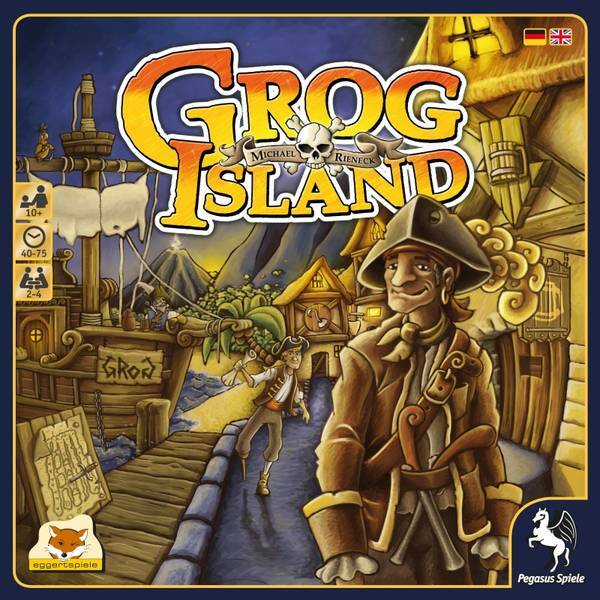 Grog Island is a bidding game but with a healthy amount of different elements riding on the bids so it sounds interesting. It is designed by Michael Reineck whose games include Cuba, Santiago de Cuba, and Palastgeflüster. Each round 5 coloured dice are rolled and players take turns using these dice to make increasing bids. A player can select any combination of the rolled dice and their total bid is equal to the total of the values of the dice they have used. If a player doesn’t want to increase the bid they can pass, and they get a reward for passing too. 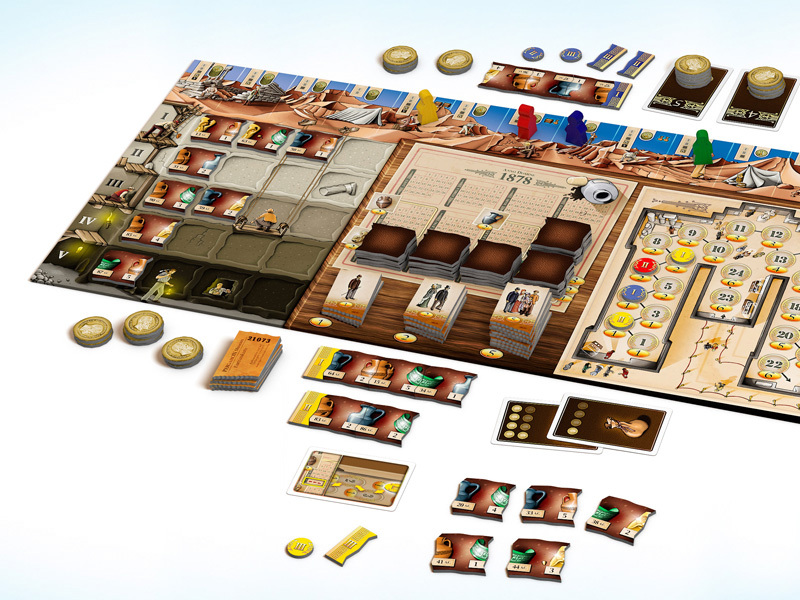 The board shows 5 coloured peninsulas with buildings on them (which players will claim during the game) and there is a ship is next to each peninsula (although the ships move around during the game). The last player remaining in a round wins the bid, pays the value in coins, and receives a benefit for each dice used in the bid (which must be placed in descending value order). The player can claim a building on the peninsula that matches the colour of the first dice and the second dice in the bid. They gain a pirate point for the 3rd and 5th dice (regardless of colour), and locks off a building on the peninsula matching the 4th dice. Players only get rewards for dice used in the winning bid so won’t get all the rewards if all the dice weren’t used. Rokoko is a euro-game about preparing for the ball at the Royal Palace. This may sound pretty light-weight but, do not be fooled, this is a euro-game with a lot of moving parts to work out, balance and combine – so it’s a game for gamers. It’s one of the games nominated for Spiel des Jahres Kennerspiel 2014 (the German complex game of the year). 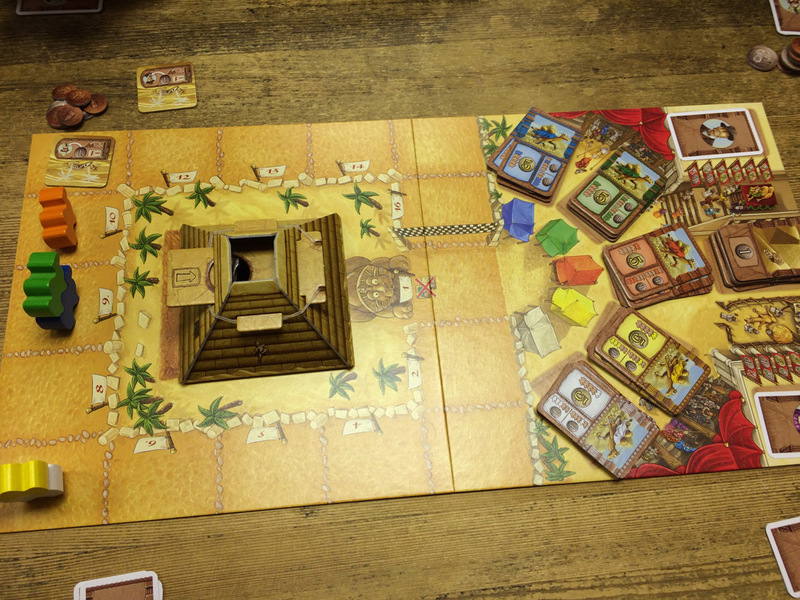 Camel Up is a simple game so it is surprising how much interaction there is and how lively it can be. During the game, camels move around a simple circuit; however, players do not own a specific camel as you may expect. Instead, players take actions which can move the camels as well as try to predict which camel will win the current round, as well as the overall race. The winner is the player with the most money (Egyptian Pounds, or EPs) at the end of the game. As writing full reviews takes some time and I often play more games than I have time to review. As a result, there are many games that I play that don’t get reviewed for while, if at all. Therefore, this is the first of a new type of post where I will post a few quick thoughts about the games I have played. If there’s a game I mention that you’d specifically like a full review of, add a comment to let me know. Byzantio is an area control game with a difference as each player only has a specific number of each of the different actions to use during the whole game so you need to ration them carefully. Players select their own objective cities. 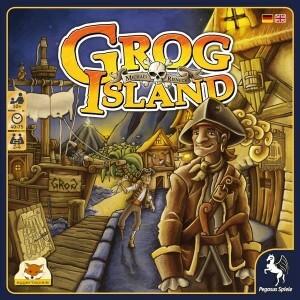 I enjoyed this game, although it felt lighter because there was a bit more randomness than I expected, with the dice deciding several of the action types adding most of that. I don’t mind some randomness in a game, so it’ll be good to have that in mind when playing it again, and I hope it’s not too big a factor for my preferences. There are a few things I’d do to add more clarity to the board, but these are polish rather than fundamental. Still, working out how to use your actions and how to try and disguise your intentions added some good gameplay. 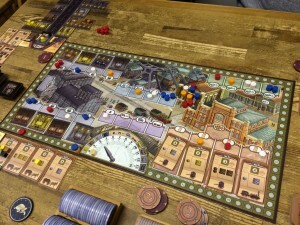 Coal Baron is by the great team of Kramer and Kiesling (also called Glück Auf) which I previewed before Spiel in Essen. This in an excellent eurogame – plenty of elements to balance but plays in a short time too. It felt like a lean and well-oiled game design made up of only the most necessary and important elements. There’s nothing revolutionary in the game design (although there is a nice small twist added to worker placement), but it impressed me with it’s elegance and how it delivered a tense, thoughtful game from such simple game mechanics. Light enough for newer players, and enough decisions for experienced gamers wanting a short game. Very impressed. Wolfgang Kramer and Michael Kiesling have an impressive track record in their design partnership with games like the excellent Palaces of Carrara, Tikal, Tikal II, Torres and Asara. In fact, Kramer has won the Spiel des Jahres 5 times (twice with Kiesling). So, I’m always interested in any game they create. 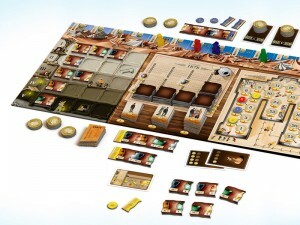 Glück Auf is a worker-placement mining game. Each player has their own mine which has 4 levels (each providing a different type of coal) and a lift shaft down the centre. The coal trucks you buy during the game must be placed on the matching level and they must also be placed on one side of the lift shaft of the tunnels they are in are torch-lit, or placed on the other if their tunnels are dark. 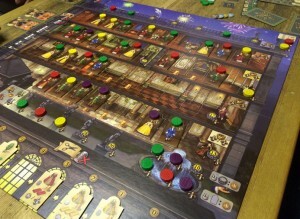 In Rokoko, players are tailors who are trying to gain the most notoriety at the royal ball of Louis XIV by outfitting the nobles. As you can see from the image of the game (which is what caught my eye in the first place), it’s a Eurogame with quite a lot going on. 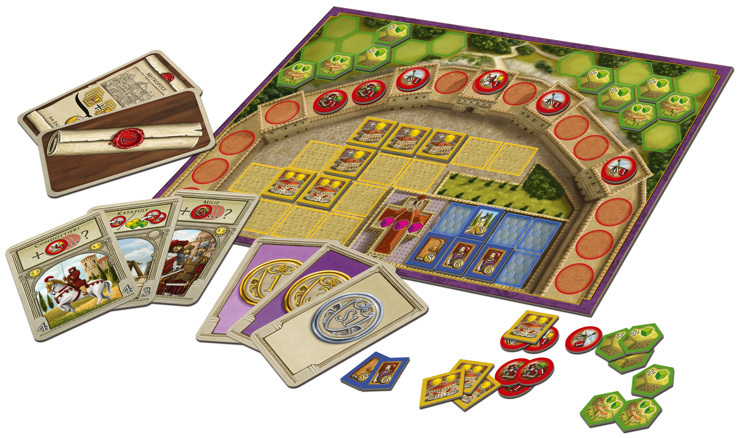 Plus, it’s by Eggertspiele and Pegasus Spiele so that also drew my attention. Each round, players take turns taking one of the 6 actions such as gain resources (the different materials required to make outfits), gain patterns (the outfits to be made), hire employees, add a decoration to the ball’s location, etc. Like you would expect from a Eurogame, players are trying to get the resources to make the best items, as well as other aspects, in order to score points. However, it is not completely straight-forwards as simply picking an action. Each player has a deck of employee cards (and they can hire new ones, and fire existing ones, during the game). Each round, players secretly select 3 of their employees to use from their employee draw deck and they use each employee to perform 1 action. Some actions can only be performed by specific types of employees; for example, the Master tailor can do any action; whereas, the Apprentice tailor can’t make a dress or hire an employee. Principato is a forthcoming game that is another game that looks to offer interesting game play but focused on a central core mechanic so isn’t too complex. During the game, players generate resources (food and money) for their city and use them to increase their military strength (recruiting militia and condotierre forces as well as building catapults). 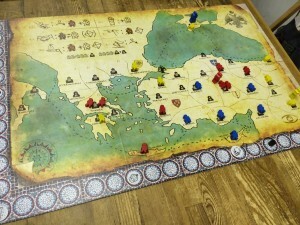 Players score victory points based on their comparative military strengths during the game (after each of the 3 game years plus 2 at random) plus bonus VPs for secret objectives and building cultural items. However, militia and condotierre forces only add to your total strength if they are allocated resources too (food and gold respectively) – and count against your strength without these resources. So, you need to balance how you use your resources. The main game mechanic is the action card system which looks nice and simple but with some tough choices. When activated, the action cards let you gather resources, convert resources into items like more banks, catapults, militia, etc. Players get 2 actions each turn which can be used to activate a card in their hand, swap a card in their hand with one of the cards on display, or take a favour cube (which counts as gold or food). When played, some action cards let the player swap the card with one on display too. Also, the oldest card on display is discarded each turn and a new one added. So, there’s an interesting element of drafting. Principato looks like it will be simple, fast and force players to make tough choices. Players can not attack or trade with each other so the player interaction seems to come from denying them cards. I’m looking forwards to trying this one. View Eggertspiele’s Principato page and rules. If you’ve read this blog for a while, you may have noticed that I like interesting game mechanics, especially those that are simple, make you agonise over your decisions and allow you to annoy other players too. From reading the rules, Pergamon sounds like it has such a game mechanic at its heart. In the game’s excavation of artefacts for displaying at the museum, one of the core mechanics is to select how much funding you will request. Each player must ask for different amounts and all players only know the rough total of funding that will be available. When all players have made their request, the actual funds available are revealed and the players that asked for the least funding will get their cash first. Players that asked for the larger amounts could end up receiving nothing at all if all the funds have been given out by the time it’s their turn to be paid. However, asking for larger amounts of funding means you get to dig up the more valuable artefacts. This reminds of my favourite part of Fresco where you choose what time your artists will get out of bed as each player must pick a unique time and the time sets turn order, your purchase costs and more. Pergamon has some other clever mechanics too like placing tiles (that show two halves of different artefacts) together to make a whole artefact, and making existing museum displays less valuable by adding even better displays. As a result, Pergamon is definitely a game I’m looking forwards to. 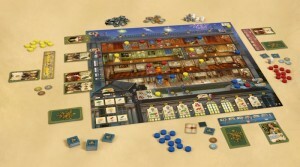 View Eggertspiele’s Pergamon page and rules.